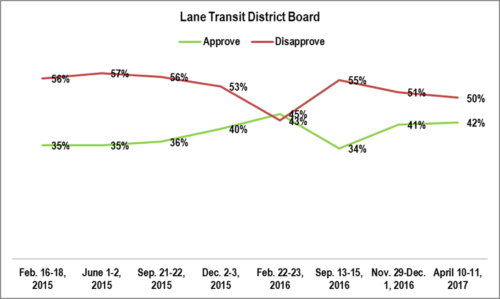 Starting tomorrow, September 19, and continuing on Tuesdays, this blog will post results from the company’s September 2017 Eugene General tracking poll. 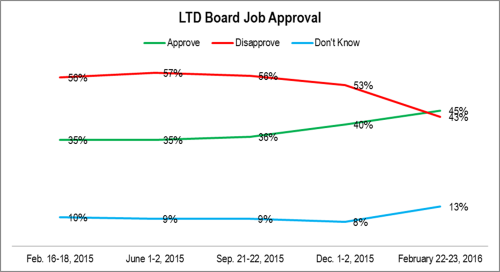 Though the LTD Board’s rating moves around quite a bit, it kept level since the last survey. METHODOLOGY: 200 live telephone interviews of City of Eugene likely General Election voters were conducted each of June 1-2, 2015, September 21-22, 2015, December 2-3, 2015, September 13-15, 2016, and April 10-11, 2017. The margin of error at the sample median for each is 7%. 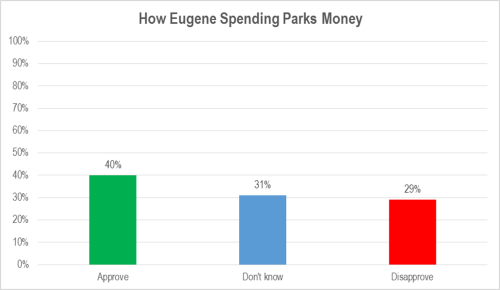 Starting tomorrow and continuing on Tuesdays will be a series analyzing a recent poll on Eugene voters. Dennis Richardson is the first Republican to win a statewide race since 2002 and the first to be elected to a statewide position since 1996. He won for a variety of reasons. An important factor, as shown by the polling presented earlier is that he had a name familiarity advantage from his run for Governor in 2014. Since 1980, only two Republicans have been elected, as opposed to appointed, to statewide office: Jack Roberts and Gordon Smith. Smith, elected to the U. S. Senate in November 1996, had just lost a U.S. Senate bid to Ron Wyden in March, 1996. Smith’s name familiarity advantage certainly helped him. Roberts, on the other hand, won in his first try for elective office. Richardson followed the Smith model to elective office and not the Roberts model. In recent years, this seems the most efficient route to statewide office for Republicans. As this blog has done during previous election weeks this blog is going to look back at an historical election. This time the blog will look at 1916 from 100 years ago. Once the dust settles, posts on the 2016 election results will resume. 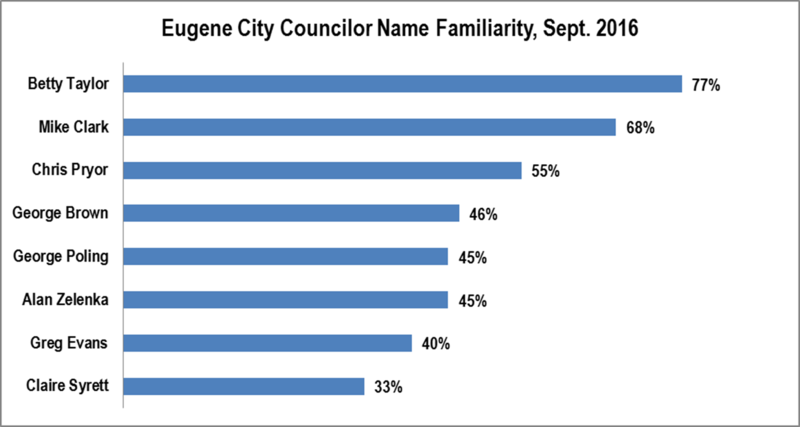 This graphic shows the name familiarity of the eight city councilors. The order is pretty much what one would expect. Betty Taylor remains the best known. Mike Clark, fresh off his mayoral bid, is next. Chris Pryor comes third. QUESTION: Now, I am going to read the names of some people and organizations. Please tell me whether you have heard of each. 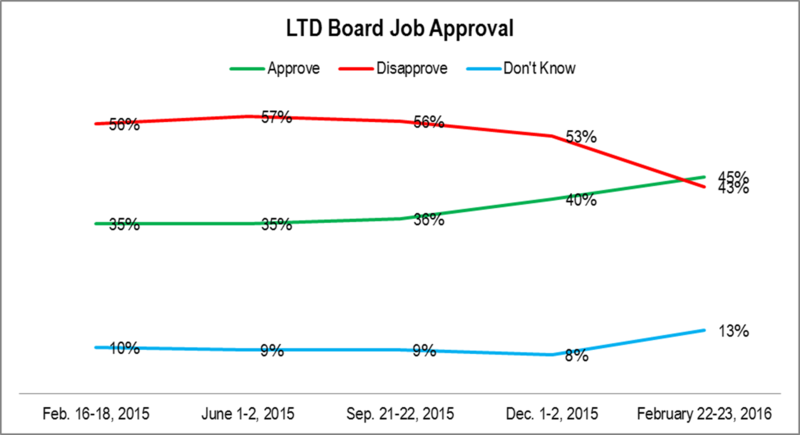 This chart goes over the swing margins in some recent contests. The idea is that not every district is created equal. In particular, it’s pretty easy for a Democrat to build up a big margin in Eugene. 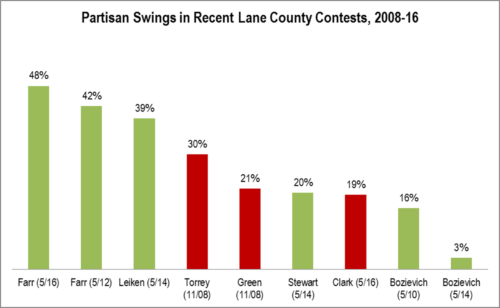 Similarly, it’s relatively easier for a Republican to win in rural Lane County than in Eugene. 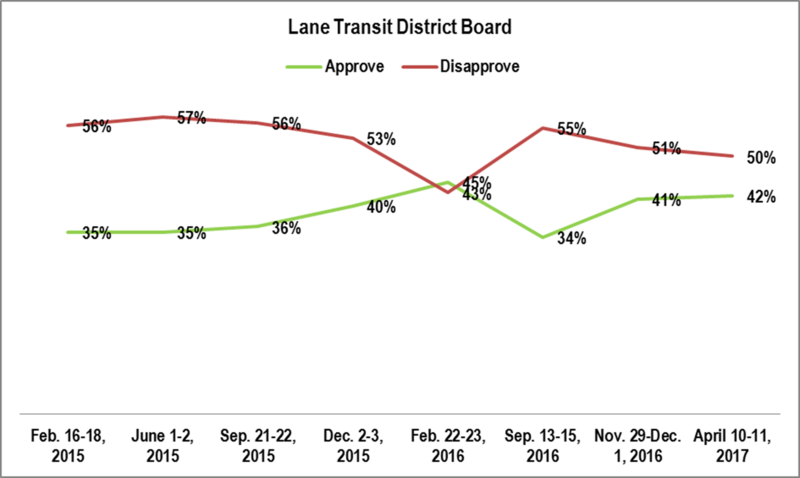 Farr’s margins, despite facing an incumbent in 2012 and an opponent with a long resume in 2016, were the largest of the group. The standard swing in the state legislature or in other areas of the state is under 10%. Methodology: Based on vote percentages at election and the corresponding voter registration figures. Equals the net margin ahead of principal progressive opponent plus the Democratic minus Republican registration margin. Green indicates a win and red indicates a loss.